Surrounded by his family, Casmir passed away peacefully on Saturday, September 1, 2018 at the Beausejour Hospital at the age of 92. He was born in Allegra, MB. 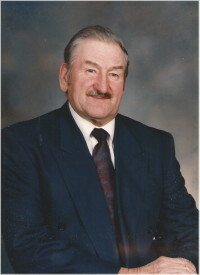 Casmir was predeceased by his loving wife of 61 years Doreen (nee Sawatski) in 2013, his parents Zygmunt and Ann Mamrocha, his brother Joe, sister Caroline Woligroski, brother Edward, parents in-law Stanley and Anna Sawatski, brothers and sisters in-law Peter and Helen Zazula, Peter and Irene Sawatski, John Garbolinski, Helen Mamrocha, Thomas Woligroski and Andrew Klym. Casmir will be lovingly remembered by his two sons Eugene (Donna) and Randy (Florence), grandchildren Kristina (Sam), Casmera, Michael and Lynn Rogoski, and great granddaughter Isla Rae Otto. He is also survived by sisters Nellie Klym and Adele Garbolinski, sister in-law Betty Mamrocha, many nieces, nephews and friends. Casmir and Doreen were pen pals for 11 years before they met. They fell in love and married in Chipman, AB in 1951 and another wedding reception followed at the family homestead in Allegra, MB. Casmir and Doreen farmed alongside one another for over 60 years. After many years on the farm, the couple moved to Beausejour. They loved their frequent visits back to the farm. At age 72, Dad retired from Manitoba Crop Insurance after 22 years. Funeral Liturgy will be celebrated on Friday, September 7 at 10:30 a.m. at Sobering Funeral Chapel, 1035 Park Avenue E., Beausejour with viewing one hour prior to the service. Interment will follow in the Allegra Cemetery. Prayers will be said on Thursday, September 6 at 7:30 p.m. also at the Chapel. The family wishes to express their sincere thank you to the Dr.’s, nurses, aides and therapists at Beausejour Hospital for the loving and compassionate care given to our dad, papa and papapa. Special thanks to Auntie Adele Garbolinski; Teresa, Janice, Denise, Patty-Jo, Phyllis, Amanda and his homecare staff “Angels” for their loving care and support. Always remember “and drive carefully”. Thank you also to the many relatives and friends that visited Dad. He always enjoyed and looked forward to seeing you all. In lieu of flowers, if friends and family so desire, donations may be made to Beausejour Hospital, Box 1178, Beausejour, MB R0E 0C0. To Randy, Eugene & Families, may our thoughts and prayers be with you all at this sad time in the loss of your dear loved one. Know in your hearts he will always be with you and a dear angel forever. Peace be with you all now and forever. Hugs to all. So sorry to hear about your Dad & Grandfather. He was a very funny man and will be missed. Have you ever lost someone you love and wanted one more conversation, one more chance to make up for the time when you thought they would be here forever? if so, then you know you can go your whole life collecting days, and none will outweigh the one you wish you had back. We will always remember the stories of the old farming days . The birthday parties and suppers listening to jokes and history. Casmir will be greatly missed by all who knew him. You are in our thoughts and hope you find peace in the following days. Casmir. Uncle Casmir always has had and will continue to have a special place in our heart. We always enjoyed our visits with him and will forever cherish the time we spent with him. Our thoughts and prayers are with you during this difficult time. Eugene, Randy and Family Condolences on the passing of your dad, grandfather and great grandfather. I am glad I had a chance to talk to you dad when he was in the hospital the same time that my dad was in. He provided me with a lot of information regarding my research of the family tree. I wish I could have made it back to talk to him some more. You have many fond memories and history that he left you with. Now he is there with your mom. We are sorry to hear of your Dad’s passing. You are in our thoughts; our sympathies to everyone. Our thoughts and prayers are with you. Uncle Casmir was a well respected, thoughtful gentleman who had a good sense of humour – we will always treasure him and remember the conversations and visits with him.